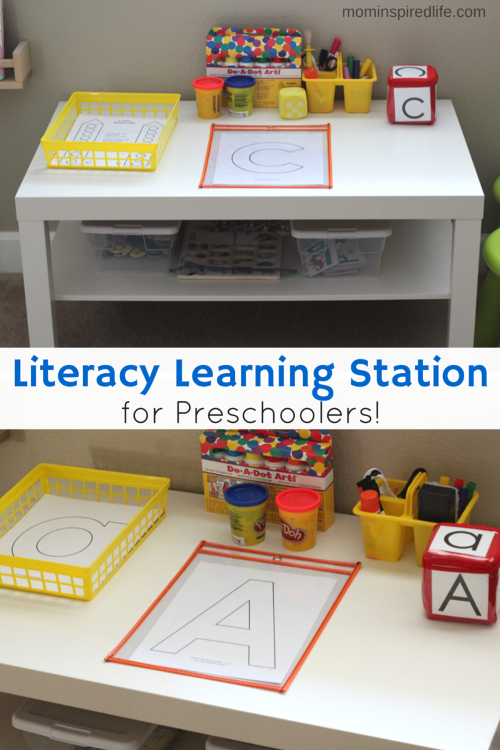 I am so excited about the literacy learning station I developed in our home! 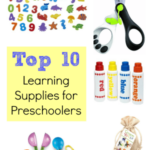 It has been working out very well and helps keep me organized and on task with teaching my preschooler. We both look forward to utilizing it every day. 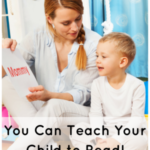 I have been doing lots of literacy learning activities with Evan, but recently decided to get a little more intentional and structured with it. Just a little! 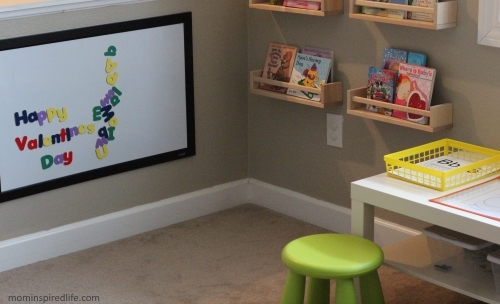 Anyway, I have always been a fan of centers in the preschool classroom and I really felt like Evan would enjoy the concept. So I developed learning stations for literacy and math. Today I am sharing our literacy learning station, but I will be sharing the math learning station in the near future and even plan to add other learning stations as well. Now, I don’t have room to set up stations all over the house like a traditional preschool setting, but I do have room for one station. So I found a great way to utilize the same space for different learning stations. First, I bought this great table from IKEA for only $20. It was the perfect size and the shelf on the bottom is exactly what I needed for additional storage in the learning station. These IKEA stools are an excellent height to go with the table, but Evan also likes to use a clipboard and sit on the floor too. The next thing I did was set up the corner right near the learning station. I have book racks hanging on the wall. These spice racks from IKEA were perfect for the space. I also hung up a white board I got with a 50% off coupon at Michael’s. 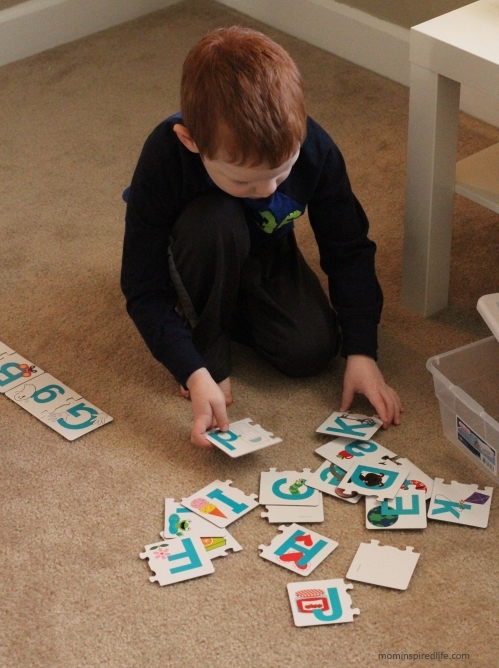 The board is magnetic so he can use his magnetic letters and numbers on it. I also write on it and use it for different activities we are doing. I bought about 10 of these $1 bins from target and have different literacy tools, games and manipulatives inside them. I also got a supply caddy and paper tray in the $1 spot at Target, but I’ve also seen them at Dollar Tree recently. Every night after the kids go to bed, I set up the literacy station. I add the printables we will be working on to the paper tray. 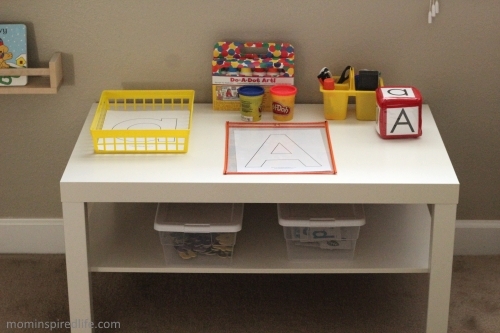 I make sure all of the supplies are set out and I add a couple of the bins with literacy games and manipulatives to the bottom shelf of the table. It only takes me a couple of minutes and is so helpful because then I am not stressing about it in the morning while the kids need me. At this point, I am teaching Evan how to use the printables, but eventually I hope that many of them will be independent work for him. I rotate back and forth between a few printables and one of the bins. 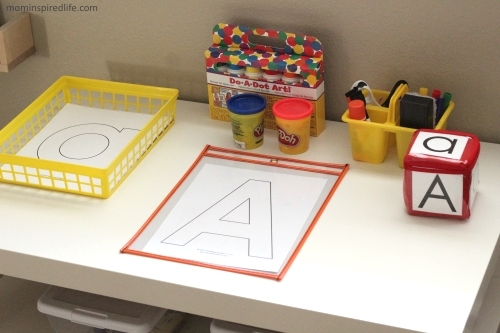 For instance, we will do one do a dot letter page and a letter hunt page and then he will choose a bin and play with the contents for about 5-10 minutes. Then I will encourage him to do another printable or two and then choose another bin. 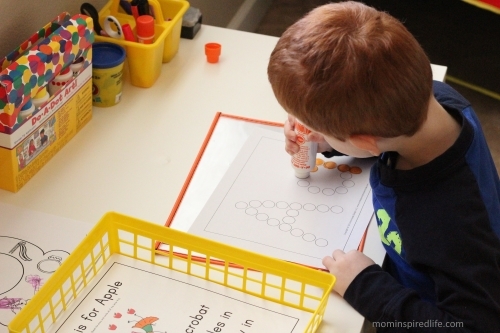 This keeps things from getting boring and keeps him motivated throughout his time at the learning station. 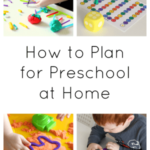 It also gives me a chance to tend to my 1.5 year old in between leading him through the printables and helping him with tasks. 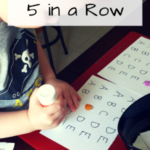 He plays with the magnetic letters or other manipulatives for a while and I play with the baby and then we go back to working on a lesson or game together. This has been working out so well! I am truly so excited about this. It has kept me organized and accountable each day, but has done so in a way that isn’t overwhelming. It has also been highly motivational for Evan. This setup still allows him to move and learn and go at a pace that is perfect for his needs. In total, we spend about 30 minutes each day at the literacy learning station, but if Evan wants to play longer, I definitely let him. I also don’t force him to stay there the whole time either. There are days where we move on after 15 minutes. Sometimes we come back to it later, other times we don’t. It is very loosely structured and I like that. If Evan doesn’t feel like working on a printable sheet, I just let him play with the manipulatives I have stocked in the learning station first. If he wants to do less of the printables, that’s fine too. It is there for him to do and I encourage him to do them, but we don’t stress about it. I also make a point to do activities that I know he will enjoy – that don’t just feel like paper work. 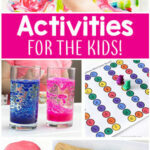 Activities that give him a chance to use supplies he loves like do a dot markers, play dough or stickers. We still continue to do many other learning activities outside of this, but I love that we now have a dedicated time and space to focus on certain skills. 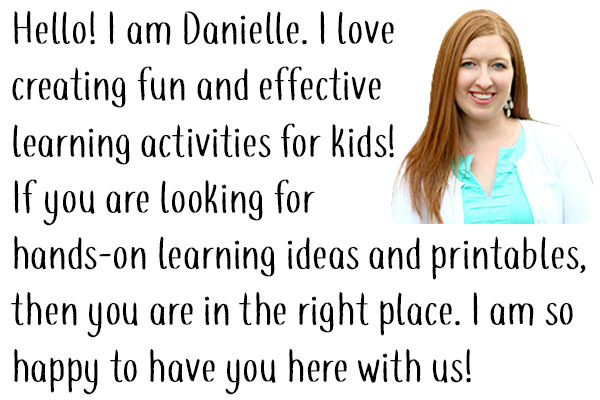 If you are wondering exactly what I have included in my literacy learning stations, that post is coming next! 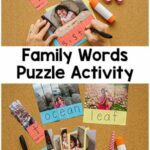 I also plan to share the list of printable sheets and activities we do each week, so you are more than welcome to follow along and do the same things with your child. I hope this will be a great resource for you! If you would like updates delivered right to your email address, please sign up for our newsletter!